The cause of the fires are caused by electrical short circuit. For that there are some things that need to be noticed to prevent hazards caused by electrical short circuit wag. 1. Entrusting the installation of the home / building you the installers that are registered as members AKLI (Electrical Contractors Association of Indonesia) and registered in the PLN. Legally installers have responsibility for security installations. 2. 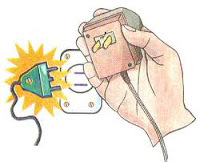 Do not stack plug or plugs too much power in one place for such connections will continue to accumulate heat that can ultimately lead to electrical short circuit. 4. If you are broke do not connect it with the fiber wire that is not functioning as each fuse has measured the ability to accept a certain load. 5. Perform regular inspections of the condition of the cable insulation wrapping, if there is insulation peeling or had thinned so that immediate replacement. Replace installing home / building your overall minimum of five years. inspection and replacement work should be performed by installers registered members AKLI and PLN. 6. Use the appropriate cable type and size designation and current carrying capacity. 7. In the event of a fire due to electrical short circuit due to safety miniature circuit breaker (MCB) is not functioning properly, turn off the power immediately from the kWh meter. Do not flush with water when the fire source is still no electricity.